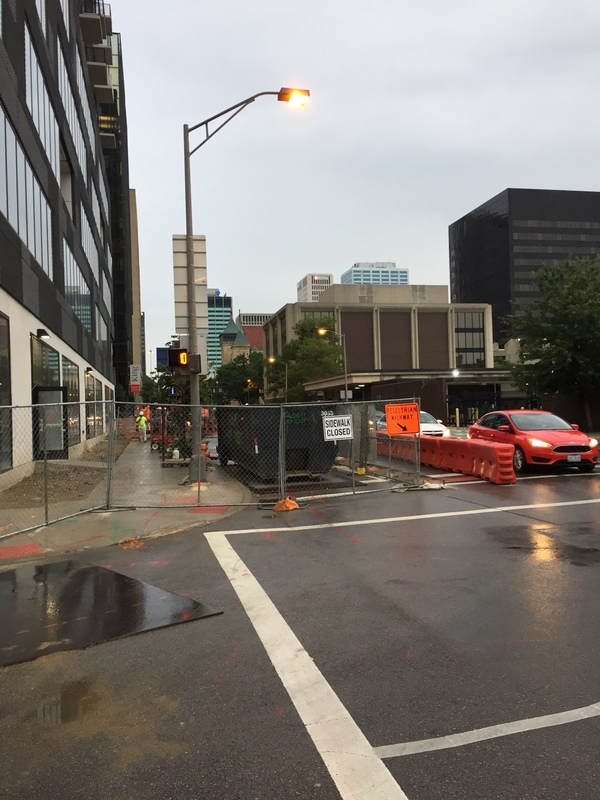 For the last year of so, every day on my walk to work and on the way home I’ve faced this same scene at the corner of Rich and Third Streets in downtown Columbus. They’re putting up a new building called 80 on the Commons. I’ve watched the construction of the building with interest, but walking past the site has been a royal pain. They’ve closed the sidewalk and one lane of Third Street so construction workers and equipment have room to work. As a result, we pedestrians have been shunted off to a narrow temporary walking lane with a chain-link fence to one side and a row of orange barriers to the other. And just on the other side of the orange barriers, so close that walkers could easily reach out and touch them, are cars, trucks, and buses speeding down Third Street. Third Street just happens to be one of the main ways out of downtown, and it’s always jammed with fast-moving traffic. It’s unnerving to be so close to the traffic, and it became even more so when I was started walking down the channel one day this winter and discovered that some driver had smashed into the row of orange barriers, crushing a few of them and knocking the rest out of line — which made me have to climb over the helter-skelter barriers to get to work. I thanked my lucky stars that I wasn’t walking down the lane when that incident occurred. Interestingly, they didn’t appear to replace the crushed barriers, they just made the barrier row shorter — which means that when you emerge at the north end of the row the orange barrier row ends before the fencing does. The temporary walking path has gotten pretty disgusting, too. Trash gets blown into the channel or is dropped by thoughtless jerks and gets trapped there, so you’re always picking your way around the newest food wrapper or soft drink can to be added to the debris field. You’d think that somebody on the construction crew or from the City of Columbus would be responsible for picking up and disposing of the trash, but the interests of downtown walkers apparently aren’t a high priority. The signs on the chain link fence have been telling me that 80 on the Commons is coming in the summer of 2018. Well, it’s the summer of 2018 already — and I’m still waiting. It looks like they are finally getting ready to end construction and reopen the sidewalk. I’ll be grateful to finally see the way clear to the office again.